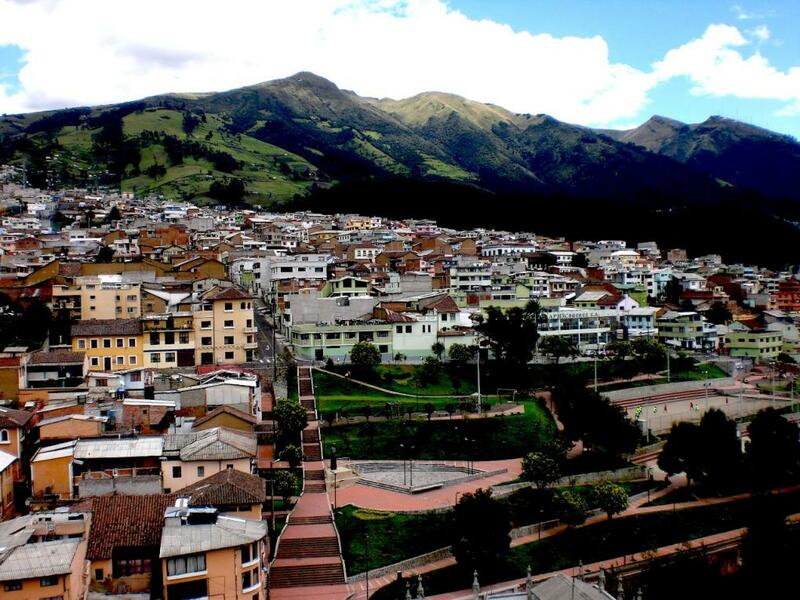 Quito, Ecuador is a city of heights and elevations. It’s one of the first things immediately evident as you walk off the airplane at Mariscal Sucre International and see the runway surrounded by mountains. The air is thin, and you may even lose a step for a few days while you adjust to the world’s second highest capitol city. Quito, a UNESCO World Heritage Center, sits at an average of 3,000 meters (~10,000 feet) above sea level and you can enjoy its highs and lows in ways both subtle and bold. Take the world’s second longest cable car, the teleferico, and climb Pichincha Volcano to a height of 4,100 meters (~ 13,400 feet). Try to go on a clear day and you’ll be able to see most of the city of Quito, which sits nicely in a valley among the Andes mountains. If you’re up for it, you can also bike or hike up Pichincha Volcano, but that’s an all day excursion and be sure you’ve had time to adjust to the altitude. In the evening make your way to the Parque Itchimbia area. It’s a bit across town if you’re staying the popular Plaza Foch (where most tourists end up) but the food and the views of the historic downtown are incredible, especially at night. Cafe Mosaico or any of the restaurants immediately next to it offer some of the best views. The entire downtown area is brightly and clearly visible, including the La Basilica Church – a site that will test your fear of heights if you have one. As I was discussing with a friend, the climb to the top of La Basilica just wouldn’t fly in the US or Europe. Upon first glance of the church, which costs $2 to enter, you just expect to walk up the flight of stairs in the tower…but, it doesn’t end there. You’ll take a small bridge across the church’s arches, and climb ever narrowing stairs (ladders really) to reach the tiny tower at the top. Many people simply couldn’t get over their fear of heights and got stuck in between ladders along the way. Don’t think about the wind or the 90 meters (~300 feet) to the top. You’ll feel like a bird perched upon the clouds and get a close look at the maze of streets below. There are 11 volcanoes – all of them active – around Quito. One of them, Cotopaxi is also a national park and you can enter for a few dollars on most days between the hours of 8am and 3pm. The summit sits 5,900 meters (~19,400 feet) above sea level and it’s cold. Bring a jacket and good shoes as you’ll be walking across snow. There are small buses and tours that go regularly and it’s much easier to find that way than driving by yourself. That said, the park is the kind of place that’s great to explore without a tour guide if you’ve got some experience hiking and are physically fit. Another great view of where hemispheres meet is the top of the Museo Ethnografic Mitad del Mundo. From there you might be able to catch a glimpse of of Quito’s snow capped volcanoes and watch tourist after tourist make the pose with one foot in each hemisphere. Just try and resist. 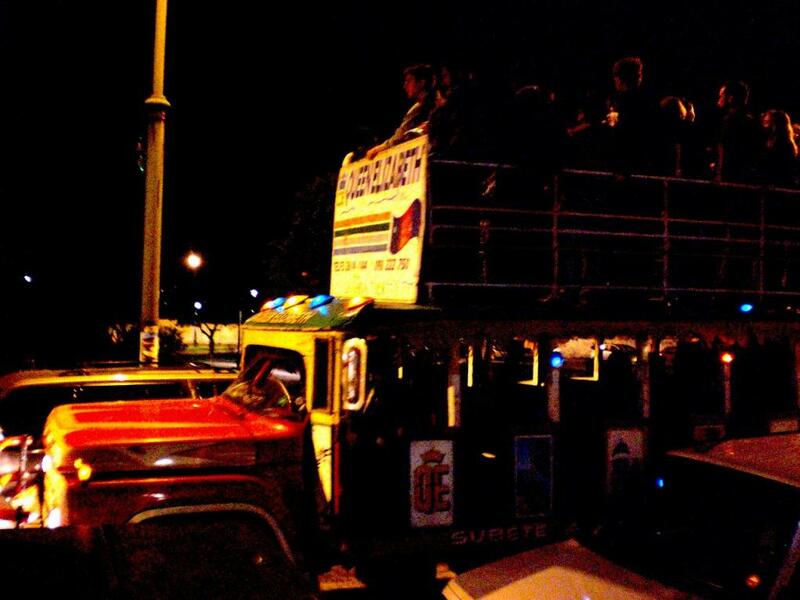 The “Chiva” otherwise known as a party bus, are hard to miss at night in the Cumbaya district. It’s a lively place full of bars and where you can go to drink Ecuadorian Pilsner beer, snack on choclos (a type of fried corn), and dance the night away. The area is relatively safe and you can wander from bar to bar. Start at a place called “58” to warm up and explore from there. The chivas run by ever now and again and on their open roofs locals dance and sing with no end. The small tomato-based dip called “aji” is a wonderfully spicy appetizer. Everyone makes aji a little different and you won’t find the same recipe at any two places. The spice doesn’t last or linger in your mouth for too long and if you’ve got a taste for food with a kick, you can add some aji to the otherwise bland “fritada” dish. 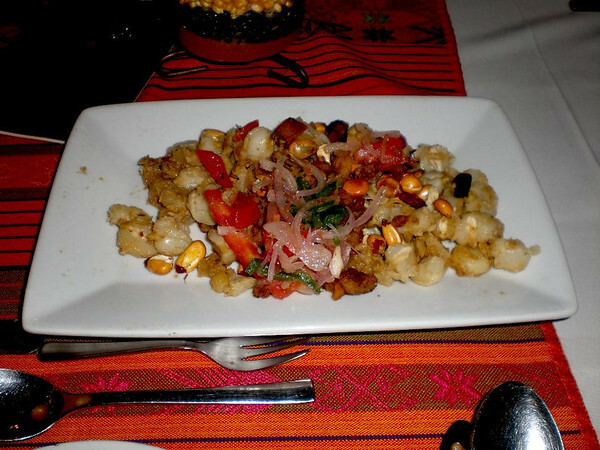 It’s a traditional Ecuadorian dish that is a mix of fried pork, corn, and potatoes although the variety varies. Finally, to bring your temperature down to normal, cool yourself down with the juice from tomate de arbol; a slightly sour but refreshing tomato juice. 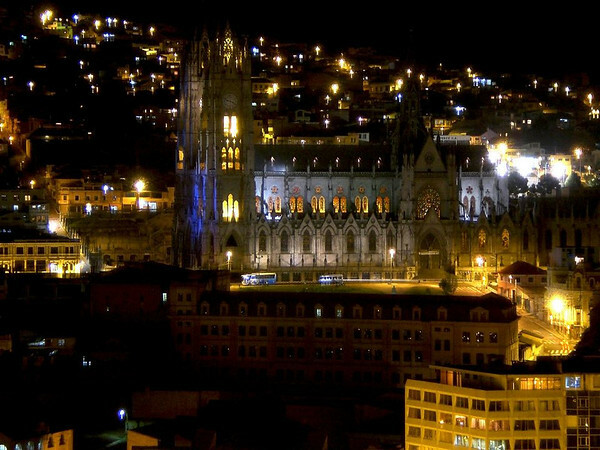 There are hot water springs right outside of Quito, and the historic downtown area’s presidential palace, church, and square shouldn’t be missed at night. Even the strolling around old colonial street, La Ronda, you can’t help but take the steep hills and valleys that define the landscape of Quito. The heights of Quito give wonderful views a the city that touches the clouds, and you’ll appreciate it that much more when you descend to explore the streets, markets, and culture down below. Yum that aji looks like something I could devour. Quito just looks like a quaint charming city nestled in the mountains. An overload of cliches perhaps but that’s too bad. Great shots Anil. That aji will knock your socks off too. Really packs a punch but I just couldn’t get enough. The pictures were all to die for- loved the running commentary. I think my two favorite pictures were 1) The picture next to ‘Dinner with a View” and 2) The FOOD- YUMMY YUMMY YUMMY!!! Thanks, that one night shot of the Basilica took me about 20 tries! Quito is surrounded by mountains and volcanos that cross the whole country on the Avenue of the Volcanoes. One just erupted in Ecuador! Well rounded profile. Can’t wait to conquer Latin America. Thanks, it was hard to do Quito justice. Great itinerary here. I love seeing cities from above as you did here with Quito. I don’t think I would be able to resist taking the tourist one foot in one hemisphere and one in the other photo. When can I go? The nice thing about Quito is, being on the equator, the weather is pretty consistent (and nice!) throughout the year. Also, the recent eruption of the volcano in Guayaquil hasn’t effected Qutio or the airport – when you do go you’ve got to post the cheesy picture!! Loving the Ecuador posts, I’ve been sending them to my Mother and Sister for when they visit me there in August. Question: I heard there was a great hostel that also overlooked the city with a great view but no one seems to know the name, any ideas? Unfortunately not. 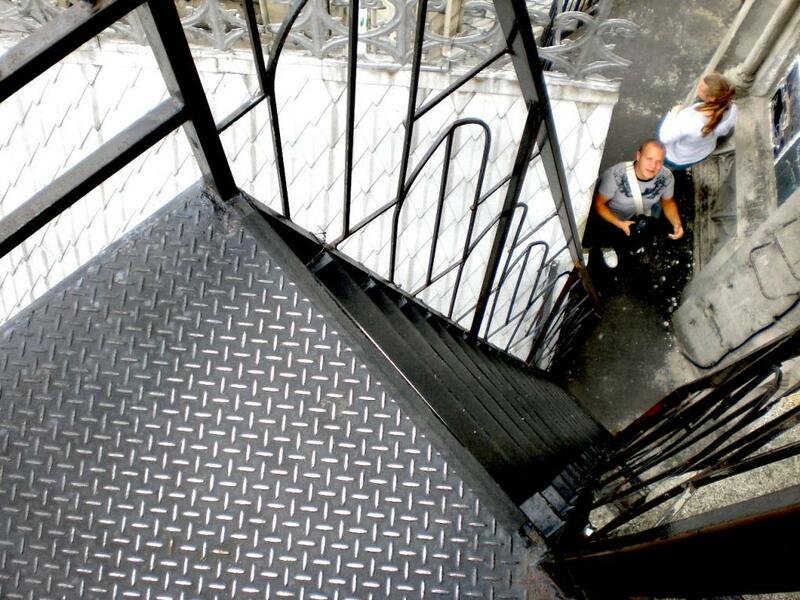 I stayed with a friend – the one recommended hostel I know of (Bluehouse) is in Plaza Foch. I’ll keep my ears open though. Interesting description of visiting Quito. I have heard great things about it, but I like that you included so many different things to see and do on a visit. I’ve been to Latin America many times and always to the same country (Brazil), so I’m looking forward to branching out one of these days soon. However, I think I have to wait until my son is old enough to handle the altitude change of Peru and Ecuador. Thanks for sharing your pictures and impressions with all of us! It took a few days before I acclimatized to the altitude but make sure he’s old enough to climb 🙂 I think kids would probably get a kick out of climbing to the top of La Basilica. Climbing bell towers and those kinds of things is a favorite of mine, but the climb you mention sounds like it scared a few people. Was it at all dangerous? Or people just felt insecure because it was so high and windy? I’ve got a post (in photos) of it coming up this week but let’s just say a slip there would probably be very, very bad. Spent a few days in Quito and can highly recommend the the Hotel Casa Aliso – about $150 a night.The place is walking distance to the touristy areas and the folks running this charming place even brought us tea in bed. Went to Cafe Mosaico too and loved it. Heard that there were lineups of tourists at the police station filing reports about being held up or pickpocketed. It is a serious problem in Quito so travel with as little money as possible or use a fake wallet that you don’t mind parting with. Ouch Leigh, the hotel sounds lovely but I’m living on $30 a day. I did hear there was a hostel that had great views as well. Sounds like a fantastic place Anil. The climb to the top of La Basilica sounds brilliant – I love things like that which clearly wouldn’t fly in the states. Is Quito budget friendly? It’s not as cheap as other parts of South America (since it uses the dollar) but it’s much less expensive than the US or Europe. Here are just some prices off the top of my head – entry to most ‘touristic places’ is $2-5, beer is .75, a *very* nice dinner is $10 per person. Cabs are also very cheap and only a few dollars for even the longest routes. All of this is outside of the Plaza Foch area which is much more expensive. Great post with overview of the city. I heard the Spanish spoken there is one of the clearest in the world. Can you confirm? Not being a native speaker I couldn’t say. I didn’t have any problems understanding anyone though due to accent or such. I think Quito is one of the most beautiful cities I have been to. I remember going to the top of the mountain on the teleferico, walking for 5 minutes, and being completely out of breath. Also love the aji and the varying mixtures, towards the end of my stay, I was almost drinking it! I’d have to agree, it’s one of the most visually impressive cities I’ve ever been to. 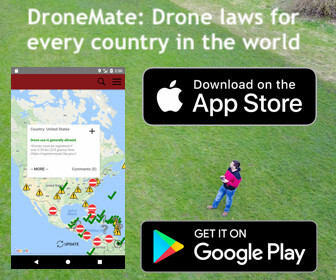 Just happened to come across your website. I am due to travel to Ecuador in 8 days time however I’m feeling a little apprehensive now with news of the volcanic eruptions the past week. Just wanted to know what the sentiment in the country is like currently? Is it still ok to come down for tourism, or would you recommend perhaps putting my plans on hold for now? Where in Ecuador will you be going? The volcano has been causing problems at the Guayaquil airport but Qutio, the coastline, Galapagos, or the eastern forests are well away and not effected. 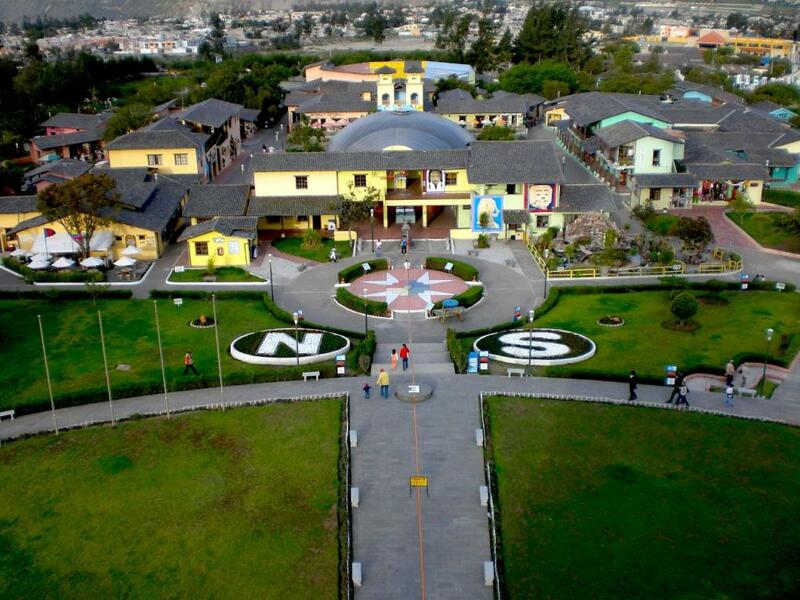 Unless Guayaquil was your primary destination in Ecuador I’d go along with your plans as is. 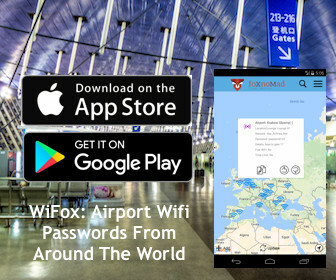 Otherwise try and divert your flight to Qutio if possible and continue on your way from there. Hope this helps – let me know if you have any questions and I’ll do my best to help. You’re very welcome and glad to hear it. Have a great trip! Where are You, come to turkey azcik, we mised You! Just talking about you, we are in altinoluk Ayvalık now… And eatong some greek food & well with ofcourse turkish food..
Oooo, naber Bujur! I am in the Americas right now, maybe Alaska or Honduras in the next few days. Hopefully I’ll be in Istanbul for a bit maybe in October, want to come meet me?